Richard was admitted to practice in the State of Arizona in 1981. He is admitted to the United States District Court for the District of Arizona, the United States Court of Appeals for the Ninth Circuit, and the United States Supreme Court. Richard earned his undergraduate degree in political science from California State University at Fullerton in 1976 and graduated from the J. Reuben Clark Law School at Brigham Young University in 1981. Richard is a member of the State Bar of Arizona, Mental Health & Elder Law Sections. He is a member of the National Academy of Elder Law Attorneys, as well as the Arizona Health Care Association. 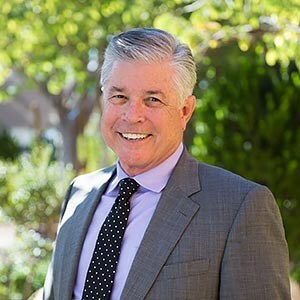 Richard serves on the Board of Directors at Mesa United Way and was the 2012-2013 campaign co-chair, helping to raise over $2.8 million to fund agencies that serve the community’s most vulnerable residents in need. Mr. White authors “Aging and the Law,” a column published in the Arizona Republic which focuses on senior issues, including Medicare, Arizona Long-Term Care, wills and trusts, guardianships and conservatorships, probate issues, and health care laws. Richard enjoys spending time with his family, including his 27 grandkids. He and his wife, Jan, spend much of their time mentoring the youth in their church. He enjoys traveling overseas and classic rock concerts.